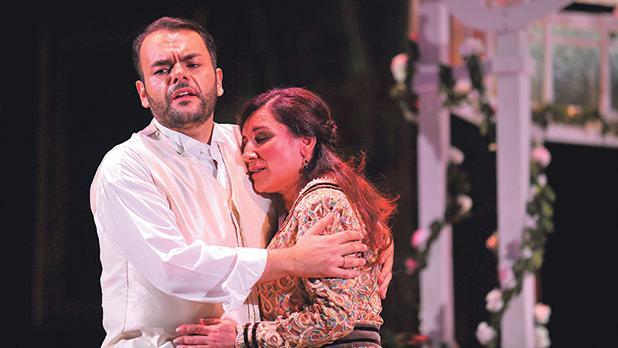 The brief opera spell in Gozo came to an end with the performances of Verdi's La Traviata at the Astra Opera House. Under review here is the second and final performance which was very well attended. La Traviata is a much-loved masterpiece which has stood the test of time. Hardened cynics would say: "Oh that woman gone astray, again!" However, even they could not remain immune to the very human story of love, sacrifice, and anyway, of a woman doomed to die in the prime of life. The music and the action combine to succeed in swaying even the most demanding and seasoned opera buff. Astra's production had the necessary ingredients to make this latest endeavour a very successful event. One had a trio of principals who rose to the occasion, the artistic direction of the well-tried Enrico Stinchelli and the Malta Philharmonic Orchestra at its best under the popular Philip Walsh. The production had some touches which I liked, such as the obsessive, silent female figure who underlines the inevitability of death triumphant hounding Violetta throughout the plot. Other touches like singers who move closer to the public, emphasised the drama and intensity of certain exchanges between characters. The beautiful sets in every scene were practical and effective, the music and the action were well paced, one saw at work not only good acting but also heard beautiful voices. Chorus mistress Maria Frendo's hard work bore the usual fruit: a large chorus which sounded simply brilliant, cohesive and on cue in all ways and moods, swell-controlled yet expansive. Violetta must be considered as one of Verdi's pet creations because he bestows so much on her but also exacts a lot from her. Not only does the role present an enormous emotional challenge but also a technical one especially from what is expected in the first scene and what goes on in the rest of the opera. Miriam Cauchi seemed to live her part very well. She went from a frivolous, little courtesan (Brindisi) to a woman with real feelings in the duet Un dÃÂ¬ felice and her great monologue Ã strano ....Sempre libera. Her love had to be sacrificed because of hypocritical social convention and without any sugary exaggeration Violetta' farewell to Alfredo, Amami Alfredo, was simply heart-rending. Hurt and humiliation was touching in ACT II in the great concertato, as was the Violetta desperately hoping for a cure, to live her love, in vain. Giulio Pelligra was a dashing, confident (in Dei miei bollenti spiriti) and full-voiced, warm Alfredo. He acted out his different states of mind very well: as ardent admirer, suitor then lover of Violetta. Equally forceful was he as the jealous man believing wrongly that his mistress had deceived and betrayed him. He acts caddishly but shows true remorse when it is too late and returns to the dying, forgiving Violetta. The villain of the piece is Germont, who is a typical product of bourgeois hypocrisy whom Verdi regales with two lovely pieces Pura siccome un angelo, and In Provenza il mar e il suol, which baritone Maxim Ansikin sang very beautifully. He also carried off well his long duet with Violetta in Act 1, scene 2 except for one or two very low notes which strangely went astray. Germont redeemed himself coming to appreciate the real Violetta Ã¢ of course, too late. The mis-en-scÃÂ¨ne already referred was fine, lavish to boot. And, of course, one must not forget the costumes, ever so good and this time created by Arrigo Costumi. Felix Busuttil's choreography livened up Flora Bervoix's party in ACT II with the well-executed dance of the gypsy girls and that of the toreadors. Secondary roles creditably interpreted were those of Flora Bervoix (Oana Andra); Annina (Dorienne Portelli); Gastone (Frans Mangion); Barone Douphol (Louis Andrew Cassar); Marchese D'Obigny (Alberto MunafÃÂ² Siracusa); and Dottore Grenvil (Riccardo Bosco). The minor roles were interpreted by Federico Parisi as Giuseppe, Mario Portelli as Violetta's valet and and Marco Tinnirello as the Commissioner. Design & Development: Keen Advertising Ltd.